Pennsylvania DMV drivers can obtain answers to their driver and motor vehicle licensing questions. 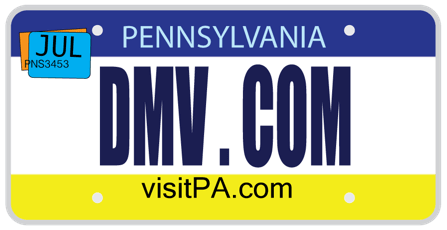 At DMV.com, we specialize in clarifying the Pennsylvania Department of Transportation processes by which you apply for car registration and other driving documents. Find compiled instructions on how to perform routine PA DMV steps, such as applying for a car registration renewal or obtaining a duplicate driving license. Additional information can be found on what to do in situations in which you may receive a traffic citation or a DUI arrest. To help users bypass a trip to the DMV in New York, we also offer online services such as obtaining a copy of your driving record. Feel free to peruse the information about our Pennsylvania Department of Motor Vehicles services below and click on topics that relate to you. A DMV drivers license is required for PA residents to drive legally. Learn more about drivers license services available through the PA DMV. Order a PA DMV driving record easily from home. Requesting Pennsylvania driving records online is the quickest way to get a driving history. Car insurance is required by the DOT for cars registered in Pennsylvania. Get low cost auto insurance in PA through our online car insurance center. Passing a Pennsylvania driver improvement course may let you dismiss a ticket or get insurance discounts. Discover PA online traffic school benefits. Completing a PA DOT practice test can help you earn a license. Take a DOT driving practice exam to test your knowledge of PA traffic laws. Renewing vehicle registration online saves you a trip to the DMV. Complete your Pennsylvania car registration renewal right from home today. PA drivers ed lets new drivers get insurance discounts and early unrestricted driving privileges. Enroll in online drivers ed in PA today. Learn how to get a Pennsylvania car bill of sale at the DMV. A DMV bill of sale records a transfer of ownership when you sell or buy a car. Learn how to pay a ticket online in PA easily and quickly. Unpaid Pennsylvania traffic tickets can lead to further DOT penalties. Get PA DUI information and learn about DUI laws. PA DUI consequences enforced by the DMV include fines, license suspension and jail time. If you plan to buy a car in Pennsylvania, consult our online resources. Buying a car online makes PA DMV new car registration much easier. Pennsylvania DOT offices are available throughout the state. Find a PA DOT location in your area to obtain the DOT services you require. This is a privately owned site and has no connection what so ever with any government agency. Our sole purpose is to help people deal with issues such as: license plates, driver’s license, auto insurance; easy and fast. There is no need to look further – the fastest way to find the info you need regarding the Pennsylvania DOT is right here! Our easy to read articles provide tons of helpful information about driver’s licenses, vehicle registration, ID information, auto insurance and more! The specific requirements given by Pennsylvania Department of Transportation, and forms to fill in are also included in our articles. Find the desired info in no time. Just type the article you want to read into the search section, or use the navigation sections for the same purpose. Readers are also welcomed to contribute to our site by giving comments, edits, and they can also post on our Facebook page and interact with other people.